" There has to be more to life than measurable benefits. What about values we can't calculate in hours or dollars? If this is all we fought for... "
Tamara never fails to send me emotionally exactly where she wants me to be with her stories...I loved the way she portrayed the historical period with all its difficulties and struggles. The main characters are two men who seem so improbable to to fall for each other at first and i really liked their interactions and the way their relationship developed. My first encounter with the author. I found her story quite entertaining. So entertaining, that I got some of her other books, which I can't wait to read. I will not praise the style of writing, the story or the characters. I will only confess I finished the rest of the books in the series for less than a week after reading this short story. 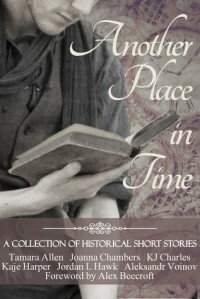 It definitely made me feel differently from the way the other stories in the anthology did. For some reason it made me feel nostalgic and even sad in some moments. The characters seemed quite honest and real - I really liked that one. I have a special attitude towards Voinov's books, since he's one of the first MM novelists I encountered, and I always, always have great expectations from his works. I haven't read The Lion of Kent yet, and perhaps this is why I could not fully understand the characters' motives. I might get back to Deliverance again, having read William's story.